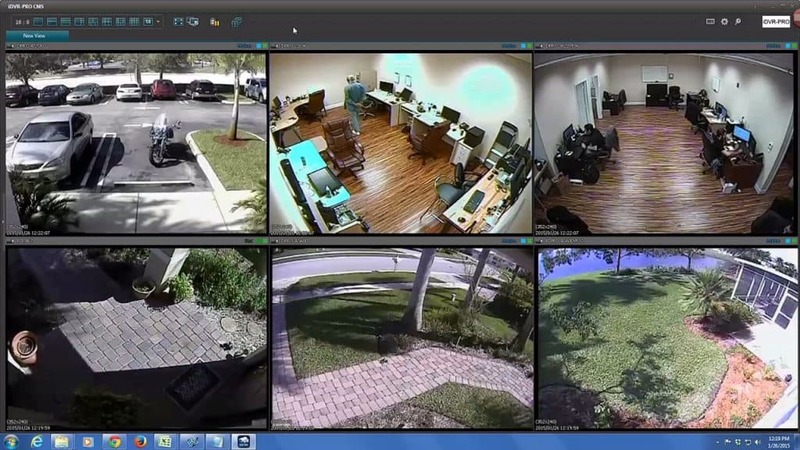 There are many surveillance system applications that require monitoring multiple locations remotely over the Internet so that security cameras can be centrally viewed. CCTV Camera Pros has helped many types of customers that require this type of central monitoring capability. Here are a few examples. Business owner with multiple locations needs to view all of their cameras remotely from their office and home. Small business owner needs to be able to view their home security cameras and business cameras on the same screen. Security company wants to offer remote camera monitoring services to their clients and needs a system that supports it. Property management company wants to remotely monitor multiple properties from their headquarters office. The solution that CCTV Camera Pros most commonly recommends consists of a high definition surveillance DVR and HD security cameras (HD over coax) at each recording location, and a Windows PC running central management software (CMS) at the monitoring location. At each location where security cameras are needed, a DVR and cameras are installed. CCTV Camera Pros highly recommends HD over coax type cameras. These are hard wired from the camera to the DVR using spools of RG59 Siamese coax cable or pre-made Siamese CCTV camera cables like these. Each location must have a high speed Internet connection, like cable or a direct fiber connection, and a network router. 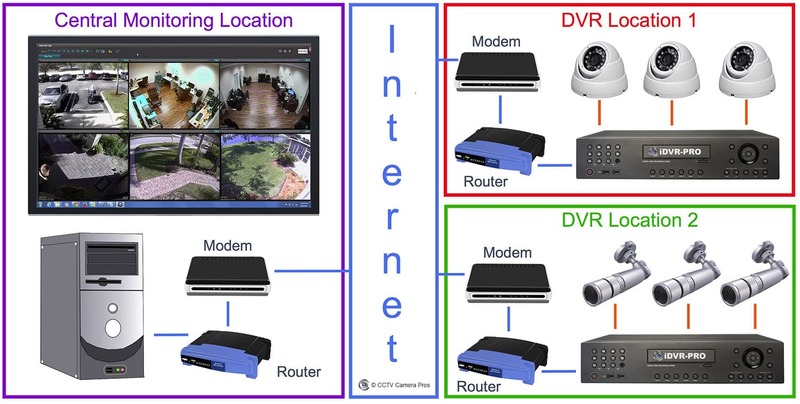 The DVR is connected to the network router using CAT5 or CAT6 network cable. The router is connected to the Internet connection modem. Port forwarding must be setup on the router at each surveillance system location. This is what allows the CMS software to connect to each DVR remotely. The central monitoring location needs a PC that is connected to a high speed Internet connection. The PC will have central monitoring software installed on it. Check out this article to see how the central monitoring software included with iDVR-PRO DVRs is configured. Central monitoring software allows the user to configure customized screens that consist of the cameras that they choose. Multiple screens can be configured and they are easy to switch between. This is a screenshot of the iDVR-PRO CMS software connected to two DVR system locations. The top three cameras are located at CCTV Camera Pros office. The bottom three cameras are installed at my house. 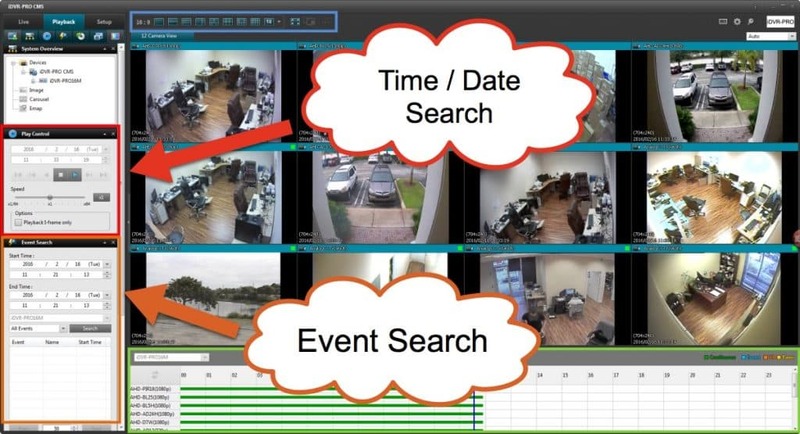 In addition to supporting live security camera viewing, CMS software also allows the user to search and playback recorded video surveillance footage from any of the locations being monitored. The above screenshot shows two methods of playback that are supported by the iDVR-PRO CMS. The controls on the left that are noted in red allow the user to select a time and date to playback from. The controls in orange allow the user to select a time frame to search the DVR for alarm events that occurred such as motion detection. This search pulls of a list events that the user can select to playback video from. Watch this video to see a demonstration of the CMS software included with iDVR-PRO DVRs. I highly recommend iDVR-PRO to most customers. They support traditional analog CCTV cameras, as well as high definition AHD and HD-TVI cameras. Please note that CMS software is sometimes referred to as central management software and other times as central monitoring software. These are the same thing. If you have any questions about this article or I can help in any way, please contact me.